Today, Nike has presented the home kit for one of the brand's big Italian clubs: AS Roma. Right here you can get a closer look at the stunning new home shirt that represents the unbreakable bond between AS Roma, the city of Rome and the club’s fans all over the world. With two rounds to go of the 2017/18 Serie A season, AS Roma looks towards securing a Champions League spot after facing defeats by Juventus and Napoli in the fight for the Scudetto. Today, Nike has presented the AS Roma Home Shirt 2018/19 to be debuted this weekend, when Giallorossi host Juventus. 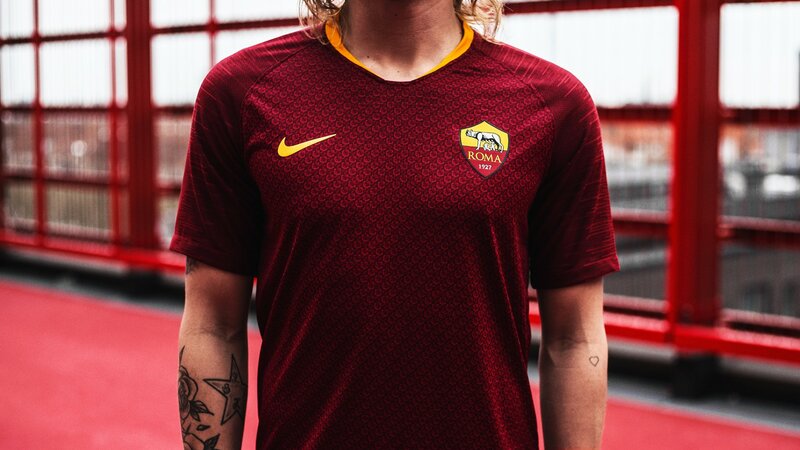 Like usual, the AS Roma Home Shirt 2018/19 is predominantly red, but this year the colour is a tad darker compared to the shade of red used last season. A 'Roma-yellow' collar and Swoosh round off the look in addition to a subtle, but gorgeous armour-like graphic print - like the ones worn by soldiers in ancient Rome - on the front and back of the kit. These links on the Giallorossi shirt represent the unbreakable bond between AS Roma, the city and the club’s fans all over the world. Based on the latest version of the Nike Vapor template, the shirt features the famous zig-zag design on the sleeves. 'Roma Siamo Noi' (We Are Rome) pride graphic adorns the inside neck, while the brand new sponsor Qatar Airways' logo will appear on the center front of the Il Giallorossi kit. Order your AS Roma Home Shirt 2018/19 right here from Thursday 17th of May.